There’s good news out of Africa. Seventeen emerging countries are putting behind them the conflict, stagnation, and dictatorships of the past. Since the mid-1990s, these countries have defied the old negative stereotypes of poverty and failure by achieving steady economic growth, deepening democracy, improving governance, and decreasing poverty. Seventeen emerging African countries—home to more than 300 million people—have undergone dramatic changes in economic growth, poverty reduction, and political accountability since the mid-1990s. Another six “threshold” countries have seen promising but less dramatic change (see map). The transformation in these countries has been little noticed by the outside world and is too often overshadowed by negative news from other African countries. But the break from the past is clear. Consider the economic turnaround in the 17 emerging countries: between 1975 and 1995, their economic growth per capita was essentially zero. But between 1996 and 2008, they achieved growth averaging 3.2 percent a year per capita, equivalent to overall GDP growth exceeding 5 percent a year. That growth has powered a full 50 percent increase in average incomes in just 13 years . Africa’s total population only passed the 1 billion mark in 2009. By 2040, it will have 1 billion urban inhabitants and by 2050, 60% of all Africans will be living in cities. Lagos, Nigeria – which will shortly overtake Cairo as Africa’s largest city – grows by 58 residents every hour; at an estimated 10.5 million inhabitants today, Lagos is 40 times larger than it was in 1950. Between 2010 and 2020, it and seven other sub-Saharan African cities will add more than 1m residents each; of those, the Congolese capital Kinshasa will by itself add 4m. Africa’s diverse and complex cities are also a magnet for consumer goods companies with the vision to recognize the combined potential of an emerging middle-class and a hitherto under-served mass market that exemplifies potential profits to be made at the so-called bottom of the [wealth] pyramid. Africa’s urban markets remain crucibles for business model innovation and adaptation, as exemplified by the trailblazing (and highly profitable) successes enjoyed by telecommunications and financial services firms over the past decade. Increasingly it is Asian consumer goods companies – having perfected their product mix and marketing strategies for targeting poorer customers in addition to swelling ranks of higher-spenders in home markets such as India or China – that are now taking the boldest steps into the region’s towns and cities. Seeing market stalls offering Indian-branded footwear and clothing or foodstore shelves stacked with Mandarin-branded produce is an increasingly common experience from Mauritania to Mozambique. While investments from the EU into Africa tripled between 2000 and 2008, Chinese FDI grew tenfold over the same timescale. The emphatically urban emphasis of African consumer demographics – combined with an increasingly congested competitive landscape – points to the growing importance of developing an African city strategy for Western companies seeking to capitalize on growing business opportunities in the continent and avoid falling further behind their Eastern competitors. Many newcomers to the region are surprised to learn that Africa already has more than fifty cities with a population of at least one million. 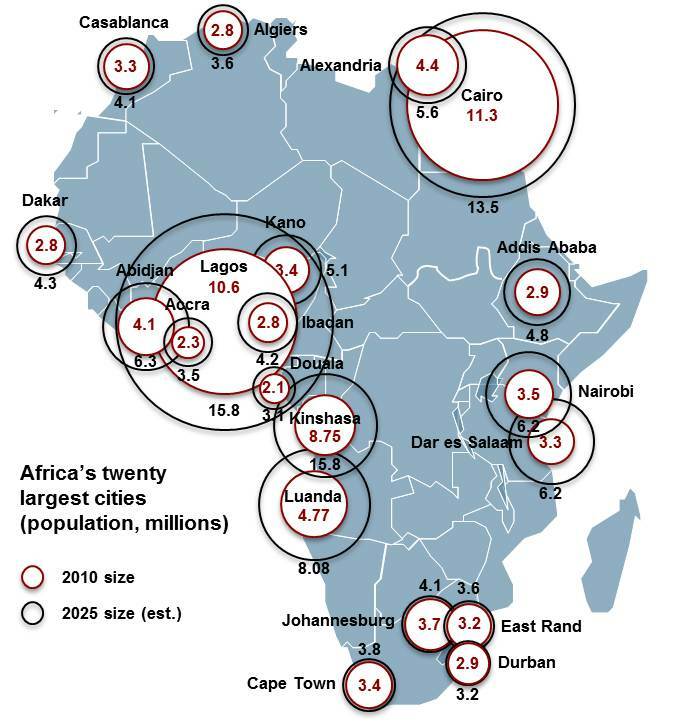 While the projected average growth of 32% for those locations from 2010-2020 is both steep and enticing, 70% of Africa’s urban population growth over this decade will actually occur in smaller cities. 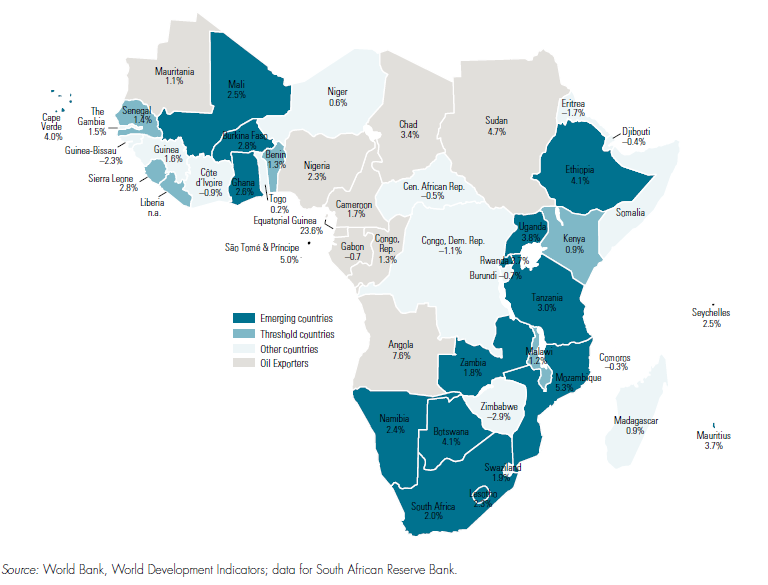 Longer-term growth strategies for the continent will therefore involve eventually spreading to capitalize on opportunities in these locations as well: by 2025, Africa is projected to have 73 cities of 1-5m inhabitants and a further 84 of 0.5-1m inhabitants. Difficult market access is often held up as an obstacle to expansion in Africa yet fourteen of the twenty largest cities on the continent are also sea ports, removing the overland logistics challenges that limit distribution and customer penetration in much of the continent. Clustering nearby cities around central hubs achieves further economies of scale, as does utilizing the so-called development corridors many African governments are prioritizing to accelerate infrastructure improvement and enhance market access and industrial investment. The spread of retail and distribution networks ever further into Africa’s interior offers further leverage possibilities: a major factor in US giant Wal-Mart’s recent investment in South Africa’s Massmart was a pre-existing footprint in twelve countries beyond its home country base. Names like Ouagadougou, Lubumbashi, Ibadan and Douala may not yet rank alongside Chengdu, Wuhan or Zhengzhou in consumer goods’ companies expansion planning but they should definitely be on the radar. Fortune favors the brave, and the well-informed. Invest in Africa! CONTACT US!